Can I Bring My Own Food in the Limo? 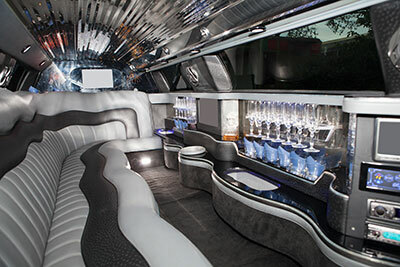 San Antonio Top Limo is your best choice for limousine rental in San Antonio. With our amazing fleet of lustrous vehicles, professional chauffeurs, and competitive pricing, it’s hard to beat what we bring to the table. Our drivers are trained for each and every one of our vehicles, and are drug tested as well. We have an extensive fleet of elegant vehicles for your choosing. We offer all sorts of services including but not limited to wine tasting tours, anniversary limousines, and wedding limousines. Give us a call and tell us when and where to pick you up, and we will get there on time ready to roll out. We have an extensive fleet of elegant vehicles at San Antonio Top Limo. Choose from one of our Chrysler 300 sedans, stretched Lincoln sedans, SUV limos, Hummer limos, or party busses. Our sedans come equipped with comfy leather seating, spacious leg room, and surround sound speakers. They’re perfect for any small family dinner trips or business talks. Our stretched Lincoln sedans are loaded with features such as surround sound speakers, a wet bar, LED lighting, and plush leather seating. These limos are great for weddings and anniversary limo rides. Our SUV and Hummer limos are bigger than our stretched sedans, and also contain flat screen TV’s. They have everything else that our stretched sedan limousines have as well, but with more seats. 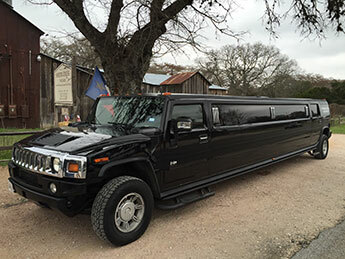 Choose from our 14 passenger Hummer limo, 14-16 passenger SUV limo, or our Texas-sized 22 passenger Hummer limo. Head out to a sports event or prom in style with some friends in one of these cool rides. Last up are our party busses. These busses are loaded with all the features you would need for an awesome party inside. Neon and LED lighting, flat screen TV’s, full sized bars and giant surround sound speaker systems make it the ride for your party needs. Heading to the Spurs game with a giant group? Our busses are perfect for giant groups heading to games, birthdays, or even bachelor/bachelorette parties. Our drivers are trained with all of the vehicles in our fleet, and you will know it. Our drivers are drug tested and background checked as well. Whenever they arrive, it will be on time and in place just for you. You won’t have to worry about any driving at all. Just let our professional chauffeurs do the driving, and just sit back and relax. Our drivers will help you with all your luggage you may have, and open and close the door for you. A common question we receive is whether or not you can bring food inside our limousines. The answer is sadly no. Food is not allowed in our limousines just because it prevents crumbs getting under any areas and smelling bad. You wouldn’t want to enter into a rotten smelling limousine. However, drinks are allowed, so grab your favorite adult beverages and bring them on board. For any limousine needs you may have, give San Antonio Top Limo a call and we will see what we can do for you.